3 Put back panel label on main system 10mm Power Display 2 (VGA) Display 2 (HDMI) Display 1 Speaker Audio In PC / Laptop PC / Laptop Mic Camera mm AVer Information Inc. No. 17, Da-An Rd., Tucheng Dist., New Taipei C Setup Wizard Rev. 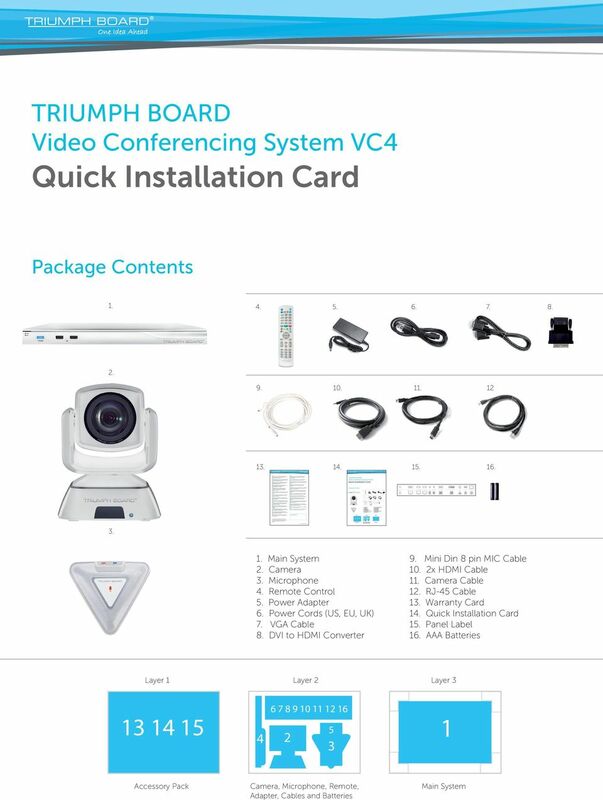 : By: yyyy/mm/dd 01 Ivy Z 圖 面 繪 製 201/0/17 Description: Artwork, V2C1E For the first time using TRIUMPH BOARD Video Conferencing System VC, the Part Installation #: Wizard will guide you to setup your VC system step by step. 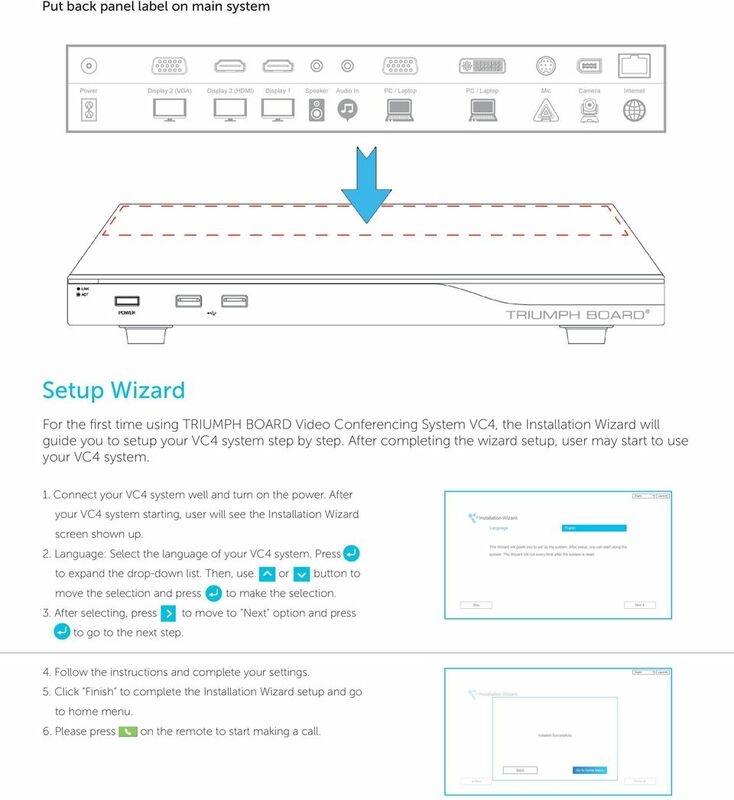 After completing the wizard setup, user may start to use your VC system. 1. Connect your VC system well and turn on the power. After your VC system starting, user will see the Installation Wizard screen shown up. 2. Language: Select the language of your VC system. Press to expand the drop-down list. Then, use or button to move the selection and press to make the selection.. After selecting, press to move to Next option and press to go to the next step.. Follow the instructions and complete your settings.. Click Finish to complete the Installation Wizard setup and go to home menu. 6. Please press on the remote to start making a call. 7 . Press LAN Configuration (IPv).. And In the drop-down list IP Address Type, choose Static IP.. Manually input the IP address, Subnet Mask and Default Gateway. 6. Select Apply and press (Enter). 7. 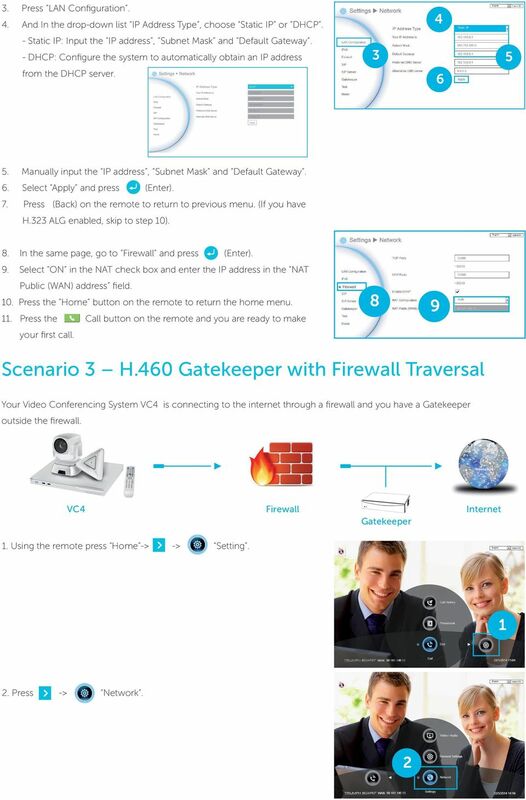 In the same page, go to Gatekeeper and press (Enter) Enter the IP address of your Gatekeeper in the Gatekeeper IP Address field and enable the Connect to Gatekeeper check box. 9. Enable the Enable H.60 firewall Traversal option Press the Home button on the remote to return the home menu. 11. Press the (Call) button on the remote and you are ready to make your first call. 7 9 Troubleshooting 1. Make sure you have changed your default IP address. The default IP address is , in order not to conflict with other devices in the same LAN, please change your IP address at the start. 2. Video conference call is established but no video or voice. 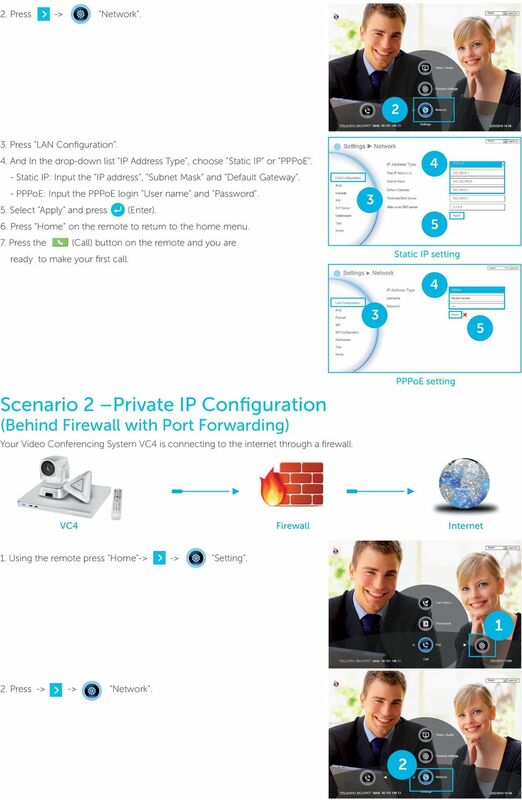 - If you are connecting to the TRIUMPH BOARD Video Conferencing System VC with a firewall, make sure that you have set up the port forwarding correctly. 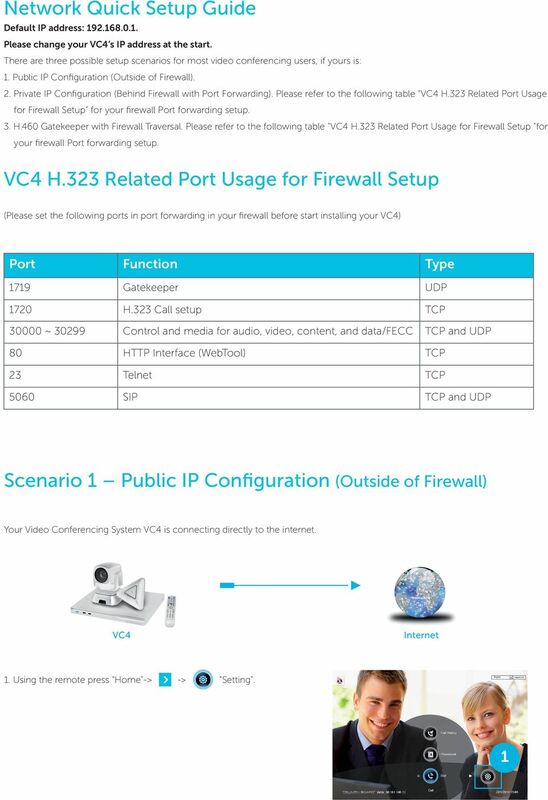 If there is no H.2 ALG firewall, please configure the NAT and the WAN IP address for the TRIUMPH BOARD Video Conferencing System VC. - We suggest having a fixed public IP address for the TRIUMPH BOARD Video Conferencing System VC. With a dynamic public IP address, it will change after a certain period which depends on your local ISP. 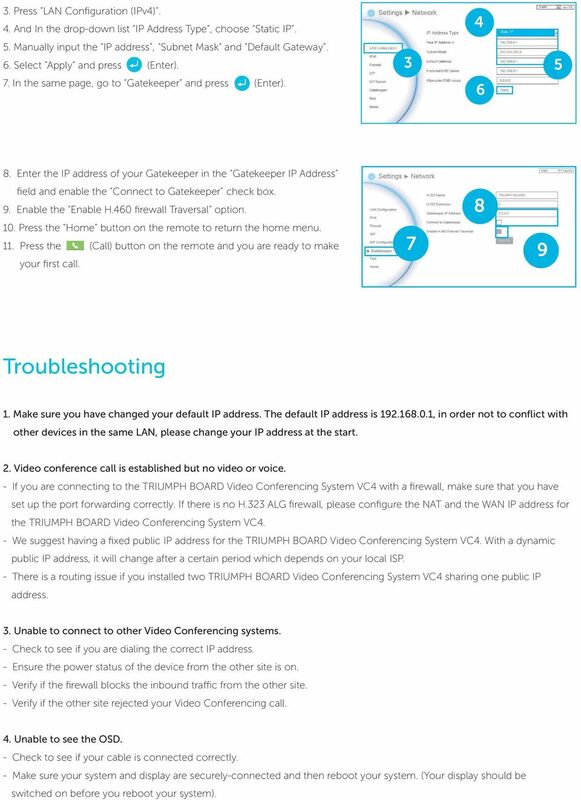 - There is a routing issue if you installed two TRIUMPH BOARD Video Conferencing System VC sharing one public IP address.. Unable to connect to other Video Conferencing systems. - Check to see if you are dialing the correct IP address. - Ensure the power status of the device from the other site is on. - Verify if the firewall blocks the inbound traffic from the other site. - Verify if the other site rejected your Video Conferencing call.. Unable to see the OSD. - Check to see if your cable is connected correctly. - Make sure your system and display are securely-connected and then reboot your system. (Your display should be switched on before you reboot your system). AVer EVC. Quick Installation Guide. Package Contents. 8. Mini Din 8 pin MIC Cable. 1. Main System. 9. HDMI Cable. 2. Camera. 10. PLANET is a registered trademark of PLANET Technology Corp. All other trademarks belong to their respective owners. Fonality Optimum Business Trunking and the Fonality Trixbox Pro IP PBX Standard Edition V4.1.2- p13 Configuration Guide Fonality Table of Contents 1. Overview 2. SIP Trunk Adaptor Set-up Instructions 3. FAQs: MATRIX NAVAN CNX200. 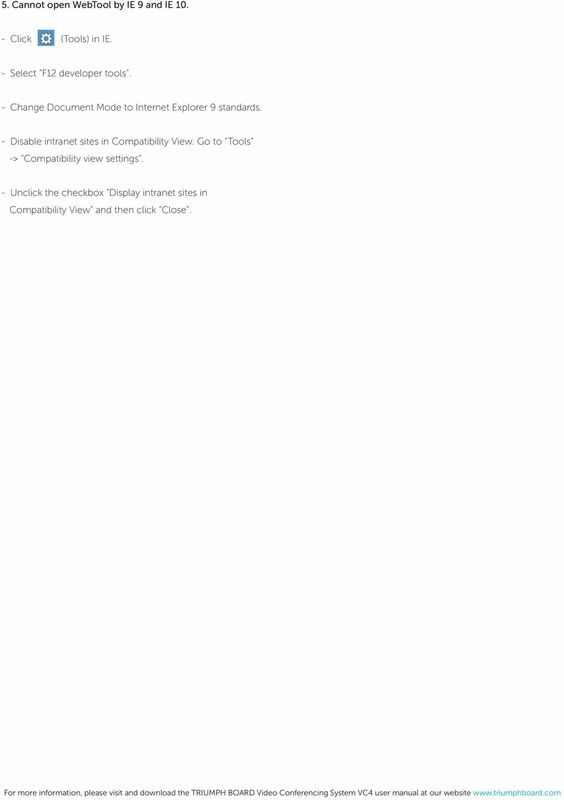 Q: How to configure port triggering? 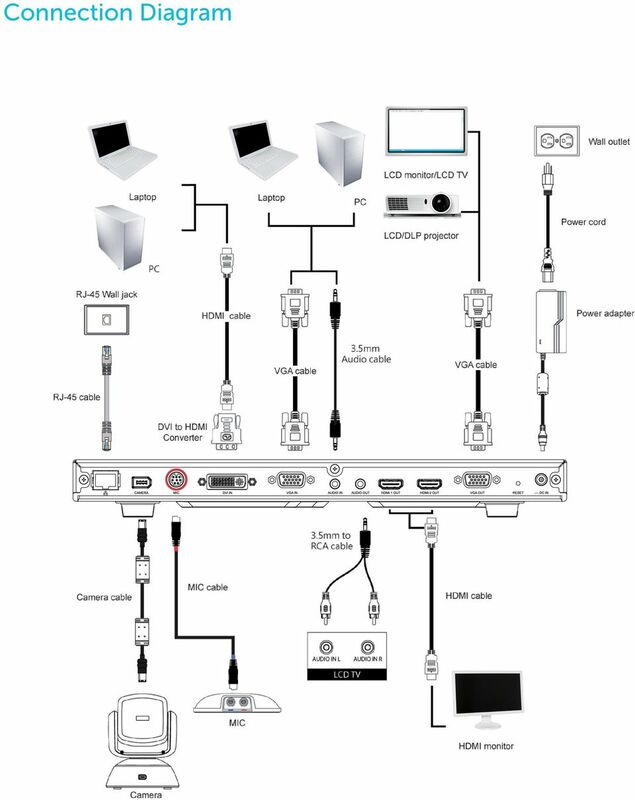 FAQs: MATRIX NAVAN CNX200 Q: How to configure port triggering? Port triggering is a type of port forwarding where outbound traffic on predetermined ports sends inbound traffic to specific incoming ports. DSL-2750U 3G/ADSL/Ethernet Router with Wi-Fi and Built-in Switch BEFORE YOU BEGIN Delivery Package Router DSL-2750U Power adapter DC 12V/1A RJ-11 telephone cable Ethernet cable (CAT 5E) Splitter (brochure). P-791R v2 G.SHDSL.bis Router Quick Start Guide Version 1.00 4/2007 Edition 1 DEFAULT LOGIN IP Address http://192.168.1.1 Administrator Password 1234 User Password user Copyright 2007. All rights reserved. V.I.P. Kit. Video Insight Pilot Kit. (Video Insight Pilot Kit).